• It’s wrong to blame Trump for anger of electorate. Indeed, with full control of both the Senate and House of Representatives, the GOP machine has still been utterly impotent in putting up any fight against President Barack Hussein Obama’s anti-American policies. After millions of dollars were bamboozled from rank-and-file Republicans, along with umpteen assurances, GOP bigwigs went along with Obama’s illegal alien amnesty scheme, funded Obamacare, backed internationalist trade deals, failed to prevent an influx of Middle Eastern refugees, and buckled on Planned Parenthood. At this time, Republicans control more seats in Congress than they have in nearly 100 years. They hold a majority of governorships and have won elections for state offices all across the country. Still, powerful enablers on Capitol Hill gave Obama a pass at virtually every turn. 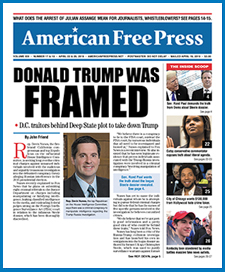 On March 9, AMERICAN FREE PRESS interviewed Jonathon D. Hill, who was elected to the South Carolina House of Representatives 8th district as a Republican in 2014. On March 9, AFP also contacted small-business owner Allen Olson, who originally founded and chaired the Columbia Tea Party in South Carolina.